Here are what the windows in my previous bedroom looked like: Pretty plain and boring window treatment. I didn’t want to spend a lot on these windows and went searching for something to make a valance for the panels that would not break the bank. I found 2 white oval cloths at the store where I work for $1.99 a piece. 1. Measure up from outer corner of window 5″ and then over away from the window – 2″. Place nail in wall at this mark to use to hang the valance. Repeat on other side. 2. 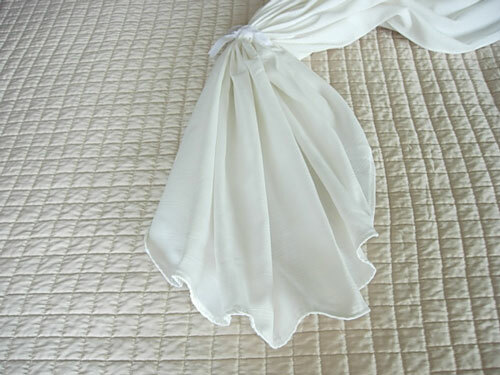 Lay tablecloth on table or bed. Start accordion folding it lengthwise until the whole cloth is folded. 3. 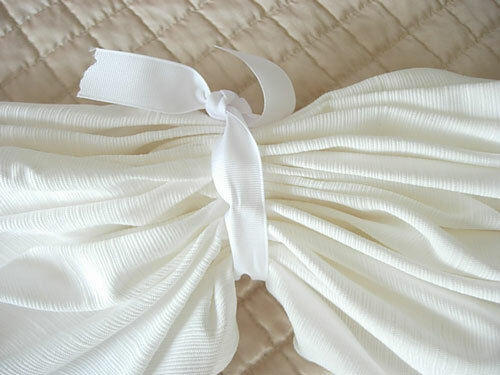 Tie ribbon onto each side about 12″ from each end. 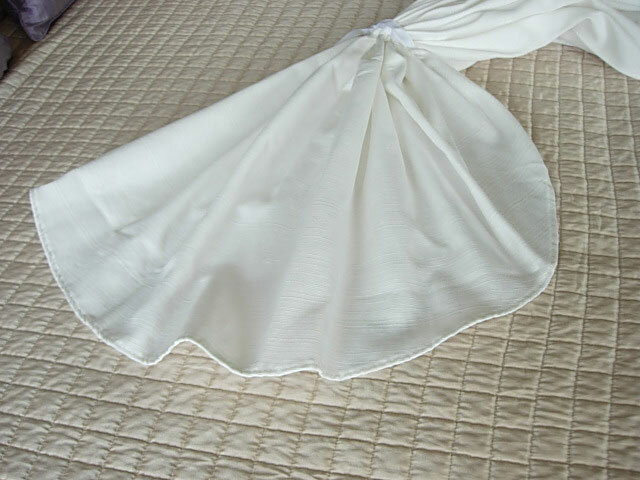 What is great about using an oval tablecloth besides the already finished edges, is that when you accordion fold the cloth lengthwise and hang it, the sides softly drape without too much fussing. 4. Hook the ribbon onto each nail to hang. Make sure sides fall to the side of the window at equal length. Adjust if necessary. 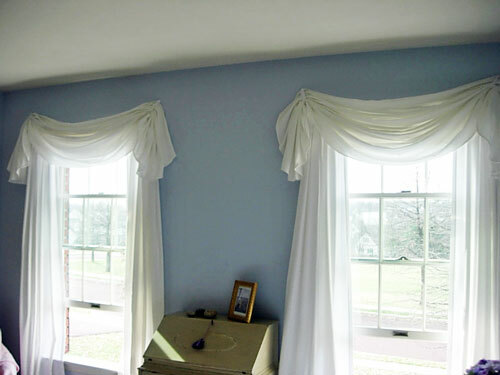 Gently pull down center and arrange folds with hands until you get evenly placed folds across the window. Fresh Air – Fresh Look for Spring! I have all made Sliding Glass Door White Drapes as well as No Sew White Drapes if you are looking to work with different window styles. The colors I use in my bedroom. I also mix the colors white and beige along with silver and gold tones in every room. I have found that if I purposely do this with these elements everything looks coordinated and never outdated. 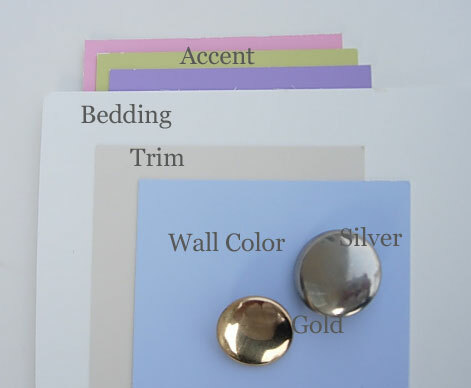 Silver/nickel finishes are “in” right now, gold tones “out”. I don’t want to remove some favorite objects they may be in a gold tone. I may have off-white trim, but have white tiles or use gold toned candlesticks with silverware. I don’t want to have to repaint my beige molding because I added white curtains. I make these basics work together by placing the color or finishes around the room so the eye registers the balance and they become part of the decorating scheme. To view more of my “No-Sew” Projects visit my page here. I could not get the last step…how did you hung it? Loved your work,it’s just awesome. 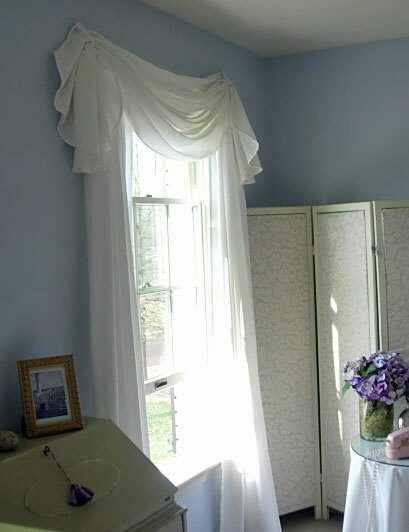 I would love to make this valance but if my curtains are white i wont get the exact same white when i buy the tablecloths ? 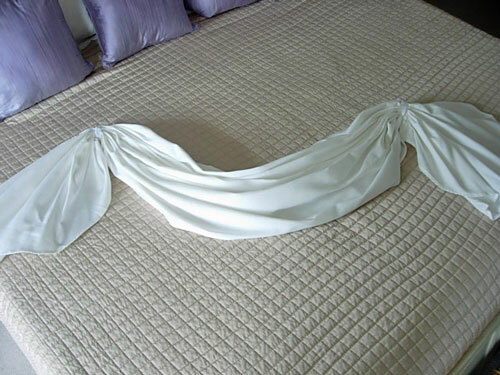 Great Idea, they look fab!..am going to try it in my bedroom.What size tablecloths did you use? Hi Hazel – I made them such a long time ago – before blogging so I don’t have the packaging or remember. When I wrote that post, I had taken them down to clean. :) They were small oval cloths. 60 x 80 ? You can make them with any size cloth. The look will vary by the width of the window. It will change how much cascades down each side. Smaller cloths won’t have long cascading sides. I am IN LOVE with your site!!!! So many thrifty projects. I did post the new-sew ottoman to pinterest so I will remember where the tutorial is! Love, love, love…. I have made no-sew curtains from cream, gold, and brown plaid table cloths purchased from Wally World. for my breakfast area. I used a curtain rod, and cafe hooks. 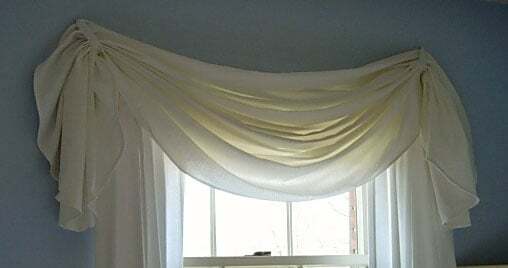 Then to tie my kitchen into the area, I bought a round table cloth, cut it in half, and used ribbon to make the end pleats, I put it up above my kitchen sink window with clear push pins. They are gorgeous, and I receive many compliments on them. Genius! I might have to steal this idea! so so cute! I love the white and that you did it with a tablecloth is amazing. Love this – looks so fresh! This looks so dreamy! I would love to fall asleep in your bedroom for sure! Coming over from Met Monday – new follower! I love this simply clean look. Thanks for sharing. I love how soft and feminine the window looks now. Wish I could open my windows, but it’s raining and only 36 degrees here. Maybe tomorrow…. Looks gorgeous, love the picture of the wind blowing through the window in the first picture. It feels like a perfect spring day. I would never have thought of using a tablecloth like that. What a great idea. And how lucky you were to get two identical ones. I can’t wait to see the rest of your tips. Wow! That is so pretty, I’m going to try this! Thanks for sharing. That’s a great window treatment! I LOVE that valance! Will definitely be trying that in my bedroom this spring. That brings back memories…my mother use to use such treatments!! Great job!